It’s no secret that I love blog events. So, pair that with fitness, another love of my life, and I’m one happy girl indeed. Last month I headed to Hale Country Club and Spa for a lovely fitness blog event with IdealFit. Fitness blog events often clash with my already busy schedule. As a result, it had been a longggg time since I last went to a fitness blog event. I was seriously excited to get back into the swing of it and sweat it out! Born in the USA, IdealFit celebrated their UK launch last month. 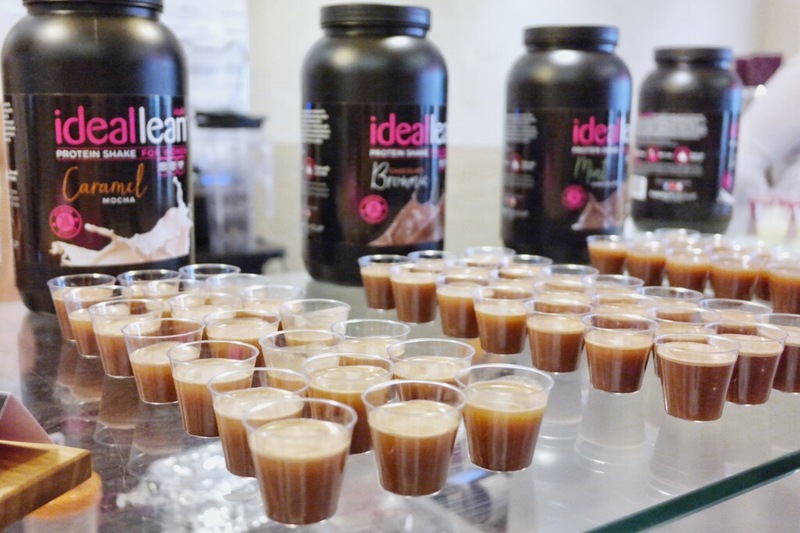 IdealFit are a US-based women’s nutrition brand and I had the pleasure of testing some of their great products whilst at their launch event in May. The event kicked off with a quick chat from Lindsey Matthews. Otherwise known as Trainer Lindsey, Lindsey is a certified Nutritionist and trainer, and the fitness guru of IdealFit. She talked us through how IdealFit grew to be the brand it is today, the #EarnYourIdeal fitness programmes and their products designed by women, for women. During the event, we were put through our paces with a high intensity 45-minute workout. We tested out IdealFit’s range of pre-workouts to make sure our energy-levels were kept high. Back when I was juggling 3 jobs and working out 5-days a week, pre-workout was a staple supplement for me. Nowadays, my work-life balance luckily has a bit more structure to it. Working from 5:45am until 11pm and squeezing in the gym is thankfully a thing of the past! Pre work-outs can sometimes have a strong tingling effect. The tingling sensation running through my veins from the the pre-workout I used to take would often be so strong that I would struggle to grip weights. With this in mind, I was a little dubious about testing the IdealFit pre-workout. But I was pleasantly surprised! Thanks to their natural ingredients, this pre-workout gave you the energy kick needed to enhance your workout without that post-exercise energy dump that you get from articificial pre-workouts. Due to their natural ingredients, the tingling effects were significantly less than any other pre-workout I’ve tried! Watermelon Ice had to be my favourite flavour. It was seriously refreshing without being overly sweet. The 45-minute workout was a serious killer. I always though one minute goes slow on a treadmill, but that’s nothing compared to how slow 1 minute goes when you’re trying to hold a plank and throw in some variations for 10 minutes! I often avoid HIIT classes. When it comes to working out, I’m a bit of a solo gym-bunny. There’s nothing I love more than putting my headphones in, cranking the volume up loud and getting lost in an intense solo workout. With that said, it was great to test my fitness skills by trying something new! I love mixing up my workout program and challenging myself with new things. Whether it’s SUP, rock-climbing, or my new addition of Jiu-Jitsu, I love keeping my exercise program fresh with different sports. So, a 45-minute HIIT class was quite the challenge for me. It was great fun though and it left me feeling tempted to book into some classes at my gym. During the workout, I kept a bottle of BCAAs close by. I already supplement my workouts with BCAAs so it was great to try out a new brand. If you’re not too sure what BCAAs are, they are essentially the building blocks for protein but you can read more on that in my handy guide to fitness supplements! After an intense 45 minutes of working out with Trainer Lindsey, I was feeling pretty peckish. Much to my amazement, we were treated to some tasty homemade protein snacks after our workout. The protein chocolate mint balls were my favourite. I’m already a fan of getting in the kitchen and baking my own protein treats; from classic protein pancakes to the less conventional protein nutella and sweet potato brownies! 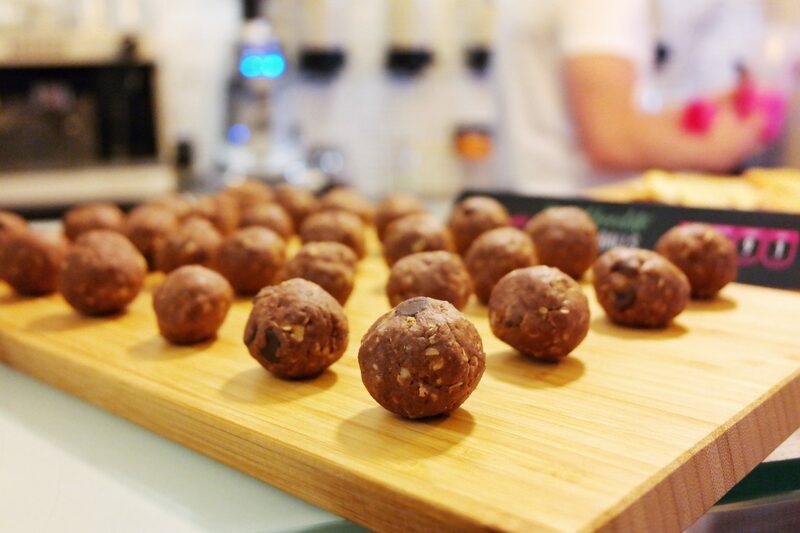 I’ll certainly be trying my hand at recreating those protein chocolate mint balls. The caramel mocha protein shake was one of the tastiest protein powders I’ve ever tried. Protein powders come in all kinds of flavours these days that your often spoilt for choice! But the caramel mocha was delicious and the mocha taste left me feeling energised. It may only be coffee flavouring but the placebo effect was good enough for me! Once we had happily helped ourselves to protein treats, it was time for one last talk with Trainer Lindsey. This time she talked us through some of the fitness programs that are on offer with IdealFit and ended with a Q&A session! The body challenges start with a free 15-day fitness challenge. This program includes free training, meal plans and exercises! They also offer a variety of different length fitness programs, which can be tailored to meet your own fitness goals and needs. As a girl who’s trying to gain muscle and weight, I often find workout programs aren’t for me. But Lindsey set my mind at ease by reassuring me that the program could easily be tailored to meet my weight-gain goals. All in all, I had an amazing time at the IdealFit UK launch event. 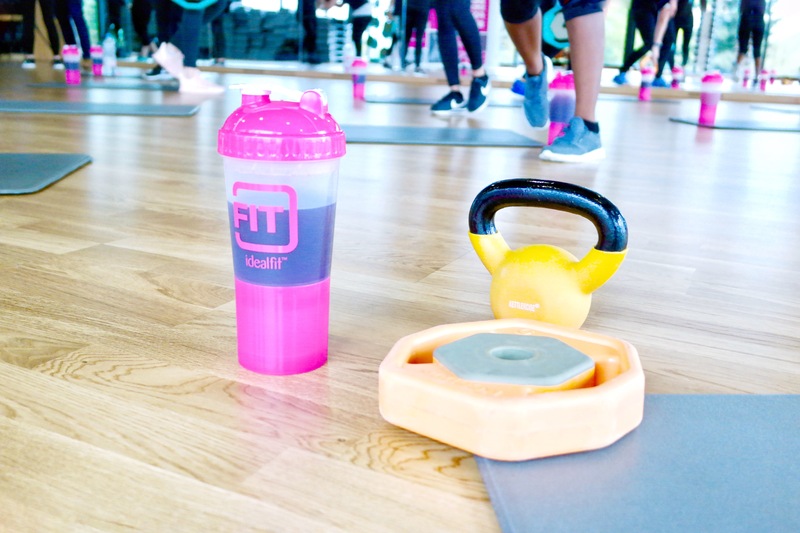 Fitness is a huge part of my life so getting to know a new brand, test their products and push my fitness limits was the perfect kind of blog event for me. As I’m trying to get more into YouTube (eek! ), I put together a mini vlog of my day with IdealFit so you can get a sneaky peek at what goes on at a fitness event.